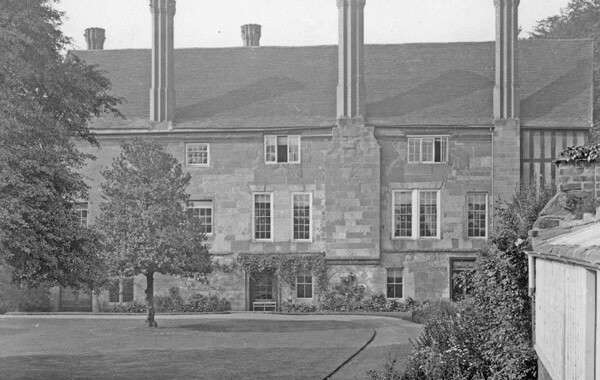 The Wyley family bought the Charterhouse in 1848 and made it their home. They owned a number of chemist shops in Coventry. William Fitzherbert Wyley took over in 1889 and he established the family’s wholesale pharmaceutical business. During his time at the Charterhouse the precious medieval wall paintings were uncovered from behind wooden panelling and preserved for future generations. As Col. W. F. Wyley he became a leading light in the life of the city. He was a founder of the Chamber of Commerce, and was the organisation’s second president 1904-6. He served as Mayor of Coventry 1911-12. Col. Wyley had many interests including public health, motoring (becoming a director of Rover in 1919), the arts and freemasonry. His military rank was due to his involvement in army reservists. Sadly, his only son, Lt. W.R. F. (Billy) of the Royal Field Artillery, was killed in 1916 in action during the battle of the Somme. Col. Wyley died in 1940. He left his home, the Charterhouse, as a centre for arts and culture for the benefit of the people of Coventry-the Trust intends to make his intentions a reality. Coventry Charterhouse estate includes the original Carthusian monastery’s Priory and Refectory (referred to now as the Charterhouse), built of local red sandstone in the late 1300’s, with enclosing inner and outer precinct walls. In addition it has the below ground remains of the grand cloister, monks’ cells, church, chapter house, laymen’s accommodation and guest rooms, plus a school. The church and cells were the subject of an archaeological dig some twenty years ago and are well recorded. The other buildings as well as a small chapel that predates the Priory remain to be discovered. The priory itself was extended at the north gable in the 16th/18th century and again in Victorian times, when a house was built on to the south gable and an enclosed veranda built on to the front elevation. Other buildings include a coach house, on two floors, sheds and an apple store. With the exception of some more recent storage sheds, all the buildings on the site are worthy of preservation. Within the former refectory is a stunning collection of wall paintings, dating from 1417 and the 1570’s, which are of historic and national importance. The earlier monastic painting is only the lower portion of a once large mural and although incomplete, is in remarkable condition and a very rare survivor from this period. The Elizabethan murals are some of the best from the era. The stone foundations of the monk’s cells remain and it is likely that the upper structure was timber framed. The intention is to rebuild two, one as an example of how the monks lived and the other acoustically fitted internally to develop and environment to experience silence. There is also evidence of a mill, fishponds and an orchard, to the north and gardens on all sides, enclosed by the outer precinct walls. The River Sherbourne, canalised here, runs through the site, with the Charterhouse to the east. The river has created a shallow valley, running north to south. After the Dissolution the monastery was stripped of materials, with the church and most of the buildings demolished. The Priory and Refectory were turned over to residential use with a few artefacts from the destroyed and stripped out monastery buildings incorporated in the conversion works. The Charterhouse survives remarkably little changed from Elizabethan times and was used as a private residence until 1941, when Colonel Wyley bequeathed it to the people of Coventry. It has seen various uses since then and a Church of England school, Blue Coats, was built in 1960’s on part of the estate, south of the Grand Cloister and gardens. Across the river, the Council has retained open land, used in part as sports pitches. To the south, the Robert Stephenson designed Sherbourne Viaduct, built as part of the London – Birmingham railway in the 1830’s, is now hidden from view by unmanaged woodland and daubed with graffiti. The viaduct was built to cross the river and wetlands, it is an elegant structure with seven bays, the widest central bay spanning the river, but since the river was canalised the wetlands have dried up. The last use of the Charterhouse was as part of Coventry City College. They vacated in 2009, since when it has been empty. The College offered the building for sale in 2011 but met with strong local opposition from the community, who rightly opposed the sale. The Charterhouse Coventry Preservation Trust (CCPT) was formed and acquired the building and some of the land in 2012. It is working its way through a backlog of repairs, to keep the building wind and watertight while it develops its plans for the future. The Trust benefits from a very active Friends group, the Coventry Charterhouse Association. Historic Coventry Trust is a company limited by guarantee and was incorporated on 1st September 2011. It is a registered charity, No. 1148237. Its registered office is Lowick Gate, Siskin Drive, Coventry CV3 4FJ.